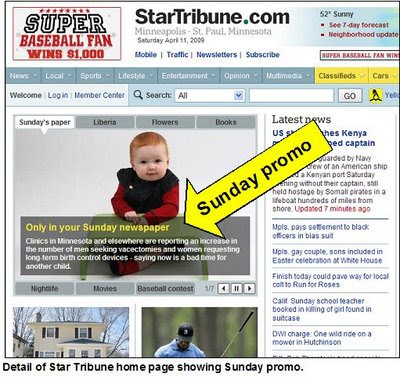 Although most newspapers rush to publish their scoops on the web as rapidly as they can, the Minneapolis Star Tribune has decided to break certain major stories and projects in print and not publish them on its website until a few days have passed. Editor Nancy Barnes tells why she is doing this – and how it’s working – in this guest commentary. I’ve gotten more response from readers on my print-first announcement than anything I’ve written in two years. Most of the comments are very positive, thanking me for rewarding paying customers with exclusive content. A few have called me an idiot and one told my publisher he should fire me and publish it as a print exclusive. Overall, though, I’ve been pleasantly surprised by the response. For now, we are holding out the best of the Sunday content, and putting it online on Wednesday. But breaking news, of course, still goes up on our website immediately. What types of stories are we holding out? Exclusive investigative pieces, most projects (except those that cannot succeed without the online pieces), deep profiles, mid-range enterprise, etc. In the Sunday paper, we label this as content that is only available in print and we are trying to make sure there is at least one piece in every section. We’ve been creating so much content just for the web and have had great success in driving traffic to the web that I just wanted to do something for our paying customers. We don’t believe we will see a significant decrease in web traffic, since so much of that is driven by spot news. But we’re watching. We may expand this model in the future if it turns out to be successful for us. You can see what stories we are holding out on the web on Sunday, because we promo them as print exclusives on the website. Some of these promos have been getting a lot of traffic, particularly if it is on a topic of great interest. Last Sunday, for example, we had a story on the collapse of a well-known auto dealer’s empire that we held out only for print. That promo got tremendous traffic. Some subscribers who read both online and in print have asked me to make the print-first content available to them online in a more timely manner, so they can read any way they want to. This is probably a next step for us. We’ve only been doing this about two weeks, so I don’t think it’s possible to point to any impact on circulation. This is an experiment. It might fail. But I think all of us have to try to do things differently, to challenge the status quo and the groupthink, to find some new ways of doing business. If it doesn’t work, we haven’t lost a thing. Great idea - in the end, it all comes down to monetizing the value you add to news. The next step would be to have a checkout system, just like an ecommerce site, where you pick up the articles you want to receive on your doorstep on Sunday. Your server could add a touch of targeting looking at the shipping address and browsing history. Digital printing does the rest. And there you are, from a 1kg, deadtree-looking Sunday you have an elegant weekly magazine people will be happy to pay 5$ for. Or at least it's worth trying. "This is an experiment....If it doesn’t work, we haven’t lost a thing." My broken record in meetings when we are debating something is "Stop: Let's just test it...our community will decide" I have been humbled too many times to think I have the answer. In the time many organizations debate, they could have tested A, B & C. This is similar to Google's "betas". As Jarvis says "What would Google do?" -- test, test, test. This sounds somewhat similar to the model adopted by the large national newspapers in Japan. Investigative pieces and all long form reporting appears only in the print edition. Breaking news supplemented by certain specialized digital sections--auto, fashion, etc--appears in the newspaper's online edition. The "Japanese" model has been relatively successful at protecting the print franchise, and newspapers there have not seen the large declines in circulation that we have seen here in the U.S.
Just wondering--did the Strib outsource copy editing to India, or do you only get "vacectomies" spelled correctly if you shell out for the print version? The Strib has done a pretty good job with handling the brave new world. VitaMN was superb when it started. The website is looking decent too. I think this new way of print scooping website is an excellent way to reward the paying customers. It should be pretty easy to make that content available to those same people online too if they wish. I've never understood why the newspapers don't put more effort into providing their print home subscribers with usernames and passwords to a "premium" section of their websites. One that would make available to them feature stories like this, access to photo galleries, archives, forums, etc. There's all this talk about charging for content online, but nobody considers pushing their websites as an extension of their print product which can provide extra features to their existing home subscribers. Even something simple like providing an enhanced comics page on the website with links to the websites of the comics that are printed in the daily paper. As operations are shrinking to 23-inch webs, reducing page counts, dropping delivery days, you have to give people incentive to keep paying for home delivery. Use your website to give something back to them for a change. Not only do you build a better online presence that people get accustomed to "paying" for, but you also gain valuable traffic - authenticated visitors whose usage can be monitored and tracked to generate usage patterns and demographic data which can be used to boost online ad sales. My concern with this approach is that often times it's not done with the specific aim of making the best product available in its given medium (with a commensurate eye towards growing that product's revenue) but rather simply to "take care of our print subscribers" or to "do something for our paying customers" (aren't you already doing something for your paying customers by printing out the news and dropping it on their doorsteps?). Of course the end result may be the same, that is a healthy differentiation between the print and online products that takes advantage of the inherent strengths of both, but it is still for the wrong reasons. A publisher's or editor's primary goal should be simply to make the best web site and the best newspaper possible and this may, in fact, mean running different stories in each and at different times. In the above commentary, however, the notion that running in print "most projects (except those that cannot succeed without the online pieces)" seems to indicate that what we're really talking about here is "print protectionism" because, after all, why wouldn't most of your "projects" have online pieces? All the news hounds out there (like me!) will be compelled to go and at least buy the Sunday paper. You know, actually having a paper in your hand sitting at the kitchen table with your spouse is SO MUCH MORE PREFERRED anyway. We often to each other for really good articles. Please do all you can to keep newsprint ALIVE! You need to do whatever you can to pay for collecting and reporting of the news. I hope this works for you. Keep in mind that each pair of eyes reading your newspaper is worth $1 in ad revenue verses 10 CENTS in ad revenue for those same eyes online. This is SO right on. Great essay. Save the good stuff for the print. Why would you do anything that kept readers away from your advertisers in print. Nancy and Strib just discovered what is known loosely as premium content. If they add a price to the extended online edition, or just some of the main features, they'd have what we know as "paid premium content" and a smart, easy-to-use, and safe solution to some of the financial problems many newspapers are facing now. In Europe, the system works for some time now. If STrib wants any details, I would be happy to help, and not only in Minneapolis, in any community where local press feels endangered. I think this is exactly the right approach. Different formats work on different platforms. You can't put video, podcasts, blogs, audio slideshows or forums (fora?) in a print edition, but long-form stories do not work so well on the web. Unless the reader has a super-large screen it is difficult to really use your best photo to the best effect on a website. Good luck with this, I think you are brave and inovative. If you truly believe your content has value, then your subscription and newstand costs should reflect that. If you are like most newspapers, your price in most areas does not even cover the cost of printing and distribution, so you are giving away your content for free. Charge more. If people won't pay more, your content is worthless. Great post, and as a former newspaper editor who jumped ship for the web, I appreciate the brave thinking. Magazines have long favored subscribers over newsstand buyers in this manner--I get the New Yorker days before it hits the stands. So why not offer this same benefit to print subscribers of newspapers? It's a great way of rewarding support without hiding content behind a firewall as "premium" web content, which is a proven non-starter--amazing anyone still thinks this is a good idea! The only downside I can see is that people who want to discuss a print story on their blog will have nothing to link to until the story comes out on the web, which might dampen the buzz. Although there are ways around this, maybe by publishing placeholder links, or thumbnail previews, or related video or photos, etc. I also agree with Richard that long form journalism shines in print, and this approach nudges people to experience it that way without penalizing them for choosing not to. Quite smart, I think!